I have multiple Timestampable definitions for one Entity but different fields. Thanks for info. We will check it and let you know. I checked your screenshot but there is missing "Field" property for the first timestamp. Are you sure you have correctly filled these values? Can you please send me your Skipper file so I can check it directly on your file? As I understand (and seems to be logical) Field property is not needed in case of On=create. 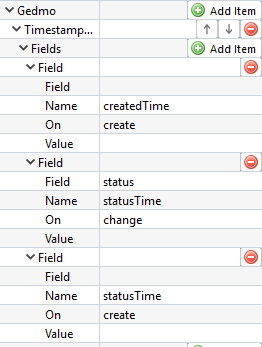 Field only valid if on=change is specified, tracks property or a list of properties for changes. You're probably right, sorry for confusion. Thanks for example, we will check it. Thanks, but based on your example, the result is valid. 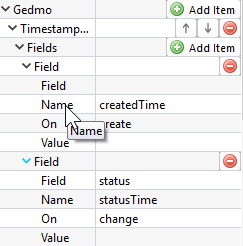 You have first field used as "CreatedTime" and second is "StatusTime"
during the time I tried to find workaround. I now added it back, and ... it doesn't generate the line for it. But for some reason I now tried to test what happens if remove @Gedmo annotations alltogether from PHP. And unbelievable ... it generated both definitions. ... Skipper does not generate the on="create" annotation (and says that file was not changed). And it stays like this on subsequent generations. So, my initial report was for actual problem, but I messed up with pic/xml. Sorry about that. Hi, we identified the problem but this will require more work to do. We're already reworking AST manipulation (import/export) so we also update it together with this issue. Unfortunately, currently I can't promise any exact term. It's a large change which allows us to support more framework in the future (starting with Laravel) so it will take some time. Can you give now that Laravel support has appeared some ETA for this fix? Hello, although first Laravel support is released, unfortunately, there is no progress in this feature. We currently skipped import of existing Php Laravel code (there is only database/MySql workbench import) because of the complexity of this issue. It's still on our todo but this change will require huge code change.